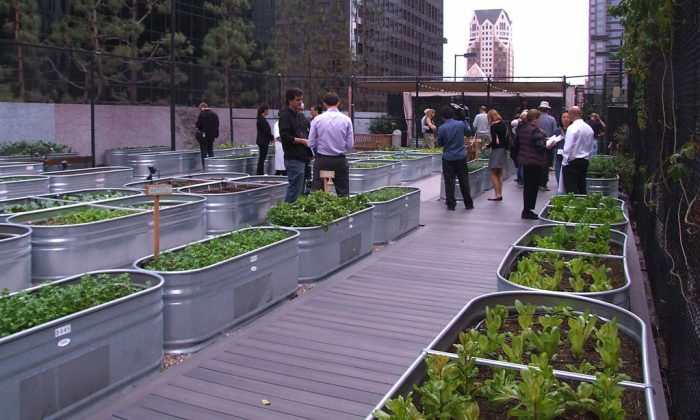 LOS ANGELES—Nestled in re-purposed horse troughs are rows of fresh, organic spinach, cilantro, and basil on top of the Jonathan Club in downtown L.A.
Jason McClain, executive chef of the Jonathan Club built the garden with his father, a retired 72-year-old landscape architect, one and a half years ago. “When you come up here, and you pick it, and then you cook it, and you make it, and you taste it, you see the difference, and that is just extraordinary,” said McClain. The garden grows special crops for each season. Summer provides the most yield with zucchini, heirloom tomatoes, figs, and blueberries. Winter produces a variety of lettuces, herbs, beets, and cauliflower. The irrigation system for the garden recycles the water, and McClain said he hopes to soon use dehydrated leftover food for composting. The restaurant saves $150,000 annually by using produce from the garden McLain said, and since he started using his roof grown food, he says reservations at the restaurant have gone up 30 percent. The garden was part of an urban, sustainable agriculture tour in the city on Nov. 11, organized by networking and informational website Seedstock. “Urban agriculture and urban farming on the fringes of cities, and within cities, is really growing,” said Robert Puro, co-founder and managing partner of Seedstock. “People see that there’s an opportunity to give more people who don’t have access to food access to fresh produce, and also there’s a huge demand for local food,” he said. Just 30 minutes northeast of downtown L.A. is an abundant one-and-a-half acre farm at John Muir High School in Pasadena. A former teacher started a garden there more than three years ago, then asked a teacher named Mud Baron to turn it into a working farm. “To work with a bunch of kids who’ve never worked before, with a bunch of kids who don’t know how to farm, how do you do that?” said Baron. But he figured it out, and now the farm has 20 paid interns who are both current and former students. The farm sells produce and flowers at local farmer’s markets and delivers boxes of in-season produce to subscribers. The school hopes to soon add a culinary program to help students connect with the full circle of growing, distributing, and cooking local food into healthy meals. In the United States, 49.1 million people lived in houses that were not able to get sufficient or proper food to meet everyone’s needs in 2013, according to the USDA’s Economic Research Service. Last year, the state legislature approved a bill that would give tax incentives to property owners who leased vacant land for agriculture for at least five years. In October, Los Angeles city council members Felipe Fuentes and Curren Price introduced a motion to do the same for Los Angeles County. “Representing a food desert community, I understand first-hand the need to expand food options for our residents. I have also seen the impact that urban farming and gardens can have on our neighborhoods, helping to bring communities closer,” said Price in an Oct. 8 press release. The Los Angeles Food Policy Council estimates that 8,600 parcels would be eligible if the bill, AB 551, is approved by the County Board of Supervisors.